The maids and hired hands of Keillor House are here to guide you on a journey into a colourful corner of New Brunswick’s past. The Keillor story is not one that you hear often: A tale of hard work and diligence where a simple yeoman-farmer from Yorkshire, England, raised his social status to become a respected Gentleman; no simple feat in those times. The story weaves through the handsome Georgian stone mansion and touches on place and politics of a young New Brunswick and leads through the entire Victorian era and a cavalcade of unique and interesting characters. 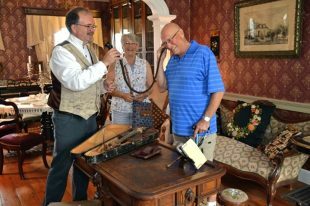 Your journey also includes a visit to the Coach House where the Dorchester Penitentiary exhibit provides a glimpse into a world that most never see. 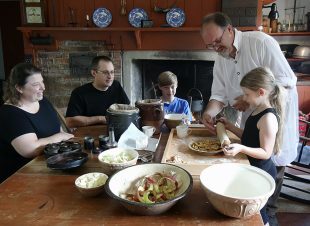 The Keillor House Experience offers something for everyone; and you never know, you just may get to meet John Keillor yourself. Looking for your roots? The Graydon Milton Library & Genealogy Centre at Keillor House Museum holds genealogical and historical materials related to Dorchester and the south east region and may be useful to researchers, writers and genealogists. Contact us for further information. 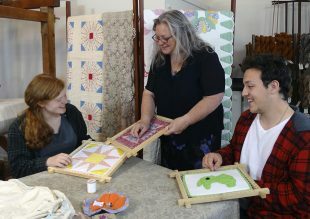 This former church built in 1884, features an insightful look into the making of textiles in the late 1800s and is home to turn-of-the-century blacksmith and carpentry tools, unique hand tools and a selection of items once used for daily domestic chores. The textile exhibits cover the complete processes of making linen from flax and blankets from wool. 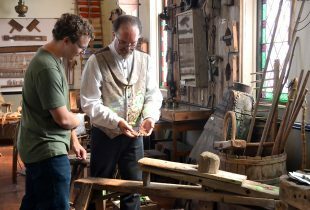 You can even try carding, spinning, and weaving on the antique looms while you are here. Become a member of the Westmorland Historical Society and receive updates on events and activities.